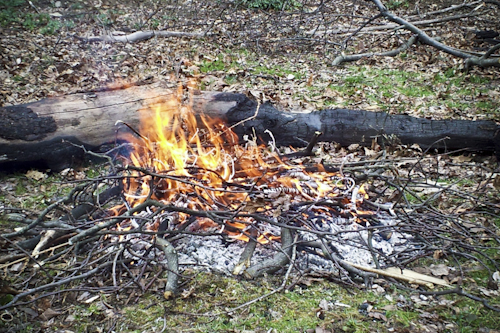 Brush burning season is open now through the first of May. But before you break out the matches, you’ll need to get two permits. This year, the process for getting and using Open Air Burning permits has changed again. In 2015, I posted about a new online permitting systems becoming available. More recently, the Town’s permitting hub moved. And this year, the Southborough Fire Department is announcing new procedures. You’ll want to read up on those before you apply for permits. As always, the burning is only for residents, not commercial properties. And residents aren’t allowed to burn brush from commercial/industrial land clearing. (Some materials from agricultural clearing are allowed.) Other Don’ts include burning grass, hay, leaves and stumps, tires, and construction material/debris. For the details including the full lists of Dos, Don’ts and Safety measures, click here. *The SFD doesn’t make the decision, they just enforce it. The Department of Conservation & Recreations’ Bureau of Forest Fire Control determines the likelihood of out of control fires occurring and The Department of Environmental Protection determines the likelihood of environmental/public impacts from open air smoke. These Departments post their decision each day by 9:00 am and reserve the right to amend that at anytime during the day. **Online payments cost an extra $1.31 for credit card or $5.50 for an electronic check. Or you can mail/drop off a check to the SFD at 21 Main Street. Make sure you reference your application number. Season Permit available from the SFD at the station. OK, got that. Here’s a solution – get your Daily Burn Permit operation piggybacked onto the town’s website, where the fee for paying bills is more reasonable (less than $1). OR – provide citizens the option of obtaining a Daily Burn Permit at the SFD. Forcing residents to go online as the only means for obtaining a Daily Burn Permit, then charging an unreasonable fee for doing so in NOT ACCEPTABLE. Perhaps you know something that I don’t. But I believe you misread what I wrote.